Gold prices reversed directions Thursday and closed lower as investors took profits and rushed into cash. NEW YORK ( TheStreet ) -- Gold prices reversed directions Thursday, falling from record highs as spooked investors took profits. Gold for December delivery closed down $7.30 to $1,659 an ounce at the Comex division of the New York Mercantile Exchange. The gold price has traded as high as $1,684.90 and as low as $1,642.20 while the spot gold price was down $8.40, according to Kitco's gold index. Silver prices settled down $2.32 to $39.46 an ounce. The U.S. dollar index was soaring 1.62% at $75.10 while the euro was down 1.39% vs. the dollar. Broad selling hit the gold and silver market as the Dow Jones Industrial Average tanked more than 300 points and some funds and investors were forced to raise cash to cover losses in other assets. Gold has rallied 5% in the past two weeks making it a prime target for profit taking. There is also speculation that the CME could raise margin requirements on a 100 ounce contract like it did with silver in May after the metal had skyrocketed to almost $50 an ounce. A margin hike means that traders would have to put up more money to buy a gold futures contract so the result is that a lot of investors are forced to sell, which decreases volatility in the long run. Over the short term, however, it can get ugly as traders exit their positions. "Last time we had a margin increase we were down about $50 for a short time only," says George Gero, vice president at RBC Capital Markets. The last margin hike for gold was at the end of January where margins were raised 11% for a speculative contract and now stand at $6,751. "Some funds are moving to cash," argues Gero, "recent buyers paid high prices and are trying to protect profits for now." Gold prices had been down almost $20 but buyers came in to support prices as many will take advantage of the dip as a "bargain" buying opportunity. Other traders will be looking at gold's price reversal as a short term sell signal. "It doesn't mean the long term trend is over," says Scott Redler, chief strategic officer for T3Live.com, "it just means that if you're trading gold for momentum or if you're in heavy ... you sell some." Redler thinks that gold could see a short term correction but says that there are still people in the market who want to buy gold on the dip, which only supports the up trend gold has been developing. "But we could use a little rest." 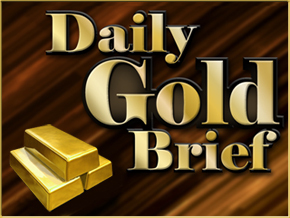 Gold prices had been popping as weekly initial jobless claims in the U.S. fell to 400,000 last week, but the prior week was revised up from 398,000 to 401,000. Four hundred thousand is the line in the sand when it comes to jobless claims, as any number above that level signals an anemic job market. Gold prices had been supported earlier in the day as the Bank of Japan intervened in the currency market for the second time this year, although this time without the support of other countries. In essence the yen and Swiss Franc, along with gold, have become safe haven harbors for scared investors. The result is that as those currencies flirt with record highs against the dollar, companies lose profits as their exports become more expensive to buy in other countries. To help their countries continue to grow, the central banks got involved with the Swiss central bank slashing interest rates to near zero on Wednesday and promising a flood of new Swiss Francs into the system. The Bank of Japan followed suit today, buying dollars and selling yen, which was pushing up the dollar 3.35% vs. the yen, but even that couldn't hurt the gold price. If anything, when governments intervene in currency markets it just reminds investors of the instability of paper money, which makes gold shine as a form of money even more. What is also notable is the lack of a selloff in gold. Typically when gold prices reach uncharted highs investors take profits, leaving prices range bound for the short term. Although some short term traders have been lightening up on positions, investors don't appear to be selling. "Where are you going to put it," argues Oliver Pursche, co-manager of the GMG Defensive Beta Fund. "There is enough buying going on that your downside risk, if you aren't a trader, is pretty limited." Pursche doesn't see any fundamental reason that would indicate a significant pullback in gold prices. He even thinks that those traders who are taking profits now will jump back in if gold breaks through the $1,680 an ounce level. "If it breaks through $1,680, I think $1,720-$1,750 is very possible." Gold's safe haven appeal is booming as concern mounts that the debt issues in Europe aren't just peripheral but that the risk of contagion is very real. Spain Thursday had to pay up to borrow money for three years with yields rising to 4.813% vs. the last auction of 4.037%. Italy's prime minister, Silvio Berlusconi, is trying to convince the market that the country's fiscal health is fine but that it's market speculation that is hurting Italy's borrowing power. The government must pay more than 5.9% in interest to borrow money for 10 years. The second safe haven factor is slower than expected growth in the U.S. for the second half of the year. "More concerning," says Pursche, is the "downward revision in the first half because it makes our starting point slightly worse." The irony is that Pursche doesn't own gold in his fund but silver instead. Silver prices haven't popped as much as gold because it is being dragged down by growth worries -- that slowing growth will eat into demand for the industrial metal. "On a supply - demand basis, gold is overbought," says Pursche, but it "doesn't mean that gold can't move higher ... we just don't like crowded trades like gold." Pursche thinks $50 silver in 2011 is pushing it but that if the metal can stay above $41.50 then the next price range would be $43-$46 an ounce. Most investors are choosing gold with the SPDR Gold Shares ( GLD - Get Report)holding 1,286 tons of gold, up 6.4% since the beginning of July, whereas the iShares Silver Trust ( SLV - Get Report) holds 9,824 tons of silver, up just 3% in the same time period. Also supporting gold prices Thursday was the news that the Bank of England and European Central Bank did not raise interest rates, leaving them at 0.5% and 1.5%, respectively. The ECB has signaled that more rate hikes in 2011 were likely, after having bumped rates up 50 basis points already this year. Inflation is currently 2.7% in the EU, above the ECB's inflation target, but the number was weaker-than-expected. Gold mining stocks were tanking Thursday. Kinross Gold ( KGC - Get Report) was down 6.19% to $15.91 while Yamana Gold ( AUY - Get Report) was down 4.46% at $13.16. AngloGold Ashanti ( AUwas trading lower $42.07, respectively. AngloGold said Thursday it made 89 cents a share in the second quarter on gold production of 1.068 million ounces, which was slightly below expectations. Cash costs came in at $705, lower than the $760 an ounce anticipated. The company has lowered 2011 production guidance and raised cash costs just like Goldcorp ( GGdid last week. The South African miner now expects to produce 4.45 million ounces this year compared to 4.75 million on the high end of the previous range. Cash costs are estimated to be $725-$740 vs. $660-$685 an ounce. Randgold Resources ( GOLD - Get Report) was a bright spot for metals up as much as 7% Thursday and is now trading up 3.14% at $93.58 after reporting killer earnings. The West African miner earned $1.24 a share, compared to 0.38 cents a year ago, on revenues of $213.4 million. Production was up 33% sequentially and 97% from a year earlier and profits surged 180% quarter on quarter. Cash costs, an area where most other miners have been struggling, decreased to $579 an ounce from $677 in the first quarter. Randgold had been suffering this year as its Loulo mine was in the midst of some growing pains and as its Tongon mine in the Ivory Coast was plagued with a civil war. One of Loulo's mines, Yalea, still needs improvement to ramp up production, according to CEO Mark Bristow, but that the first of a high grade gold section is being mined. All political unrest in the Ivory Coast has also ended so Tongon is operating normally and should be connected to the national electricity grid this quarter which would further reduce power costs, according to the earnings release. Randgold is still in the process of ramping up production to go full steam ahead but it has been one of a handful of gold miners able to make good on its promises and that looks set to meet 2011 production targets without higher cash costs.